Published November 13, 2018 by Jovana R.
Oatmeal bath bombs recipe – a full, easy step-by-step tutorial on how to make your own luxurious, soothing, nourishing DIY bath bombs with oatmeal, shea butter and Epsom salt. Perfect for sensitive skin. Every once in a while, every girl needs a nice, long, relaxing bath. It is a great way wash away the stress of the day. Just thinking about soaking in a tub filled with warm, bubbling, aromatic water can make you feel nicely snuggled up and improve your mood. A bath can do even more than that, depending on what you add to the water. Making your own DIY bath bombs gives you a lot of control over the quality, scent, color and personal preferences. And oatmeal bath bombs are one of the best choices you can make, no matter your skin type. You can find down below an oatmeal bath bombs recipe. It is one of the simplest bath bombs recipes you can find. But first, let’s see why these bath bombs are so good for your skin and how each ingredient contributes them. Oatmeal bath bombs are especially good for dry skin, sensitive and irritated, that can’t take much of artificial colors and scents and other harsh ingredients. Oats are very calming, soothing and nourishing to the skin. They contain zinc, which gives them anti-inflammatory properties. This makes oats perfect for treating sensitive skin and might even help in dealing with acne. In fact, oats are so good in soothing irritated skin, they are often used for treating eczema, poison ivy rash and contact dermatitis. Oats also contain beta-glucan, which creates a protective film on your skin that keeps the moisture in. It improves the skin’s natural barrier and helps in protecting your skin from chemicals, pollutants and other environmental influences. Oatmeal bath bombs cleanse your skin gently and naturally. Oats contain saponins that cleanse your pores from dirt without causing irritations, and colloidal oatmeal’s fine particles collect excess oil from your skin. Add to all of this that oats are packed with antioxidants that fight free radicals and that way keep your skin youthful and glowing, and it’s easy to see why oats are one of the best ingredients you can put in your DIY bath bombs. For this oatmeal bath bombs recipe, we will be using colloidal oatmeal. Colloidal oatmeal is very finely ground oats that will easily dissolve in a tub. But, if you don’t mind small pieces of oats floating around your bath water, you can simply grind some oats and use that instead. The benefits for the skin will be (almost) the same. Another option is to use ground oats, but wrap the finished oatmeal bath bombs (each separately) into a thin cotton cloth before dissolving them in your bath. The cloth will keep all the larger pieces in, which will also make cleaning the tub much easier. Shea butter is another amazing ingredient for your skin. It adds on the quality of any DIY bath bombs and raises them to the level of luxurious spa body products. Shea butter is high in fatty acids, like oleic, stearic, linoleic and palmitic acid. This makes it extremely moisturizing to the skin. It also contains vitamins A, E and F. Shea butter is gentle and nourishing, suitable for sensitive skin, even baby’s. But it is also rich and potent, capable to calm even very dry skin. It can also slow down the aging signs. Shea butter penetrates the skin and supplies even deeper layers with nutrients. This butter has antioxidant, anti-inflammatory and antibacterial properties. It improves collagen production and skin elasticity. It makes your skin soft, supple, firm and well nourished. You can find here 7 other amazing recipes with shea butter to treat your skin and hair. If, for some reason, you don’t want to use shea butter for this oatmeal bath bombs recipe, you can substitute it with mango or cocoa butter, or with sweet almond oil, coconut oil, olive oil or any other natural oil. Epsom salt is a great addition to this oatmeal bath bombs recipe. It dissolves dead skin cells, helps exfoliate the skin and detoxifies it. It helps you get rid of rough, dry patches, evens out the skin tone and gives you clear, imperfection-free skin. And since it regenerates the skin and encourages it to renew itself, your skin will look youthful and radiant. But more than just making your skin pretty, Epsom salt also helps in muscle relaxation. It relives muscle and foot ache and helps with sprains and bruises. If you want, you can replace Epsom salt with Himalayan pink salt. Himalayan salt also has numerous benefits for your skin and health, plus it will color your oatmeal bath bombs into a pretty, subtle pink shade. You can skip essential oils in this bath bombs recipe. That way, you will get only a very subtle, creamy scent of oatmeal and shea butter. But, why should a bath be only a bath? Why not use the opportunity and these oatmeal bath bombs to transform your bath into a fully relaxing spa-like experience? After all, that is a beauty of making your own DIY bath bombs – you can do whatever you want. 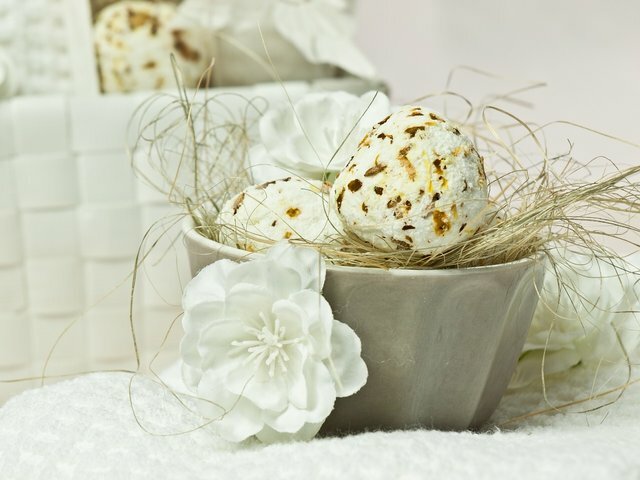 In this bath bombs recipe, we will be using jasmine essential oil because of its sweet, romantic floral scent. Jasmine essential oil boosts energy, improves mood and reduces anxiety. It also has antiseptic qualities. This oil is often used to treat dry, dull and dehydrated skin. Jasmine has calming effect on the body and mind and it’s a great choice for nighttime baths since it helps to treat insomnia. Lavender, rose, orange, bergamot, rosemary or ylang ylang essential oils are also great choices for any oatmeal bath bombs recipe. Now that you have these amazing high-quality ingredients ready, all you still need are citric acid and baking soda, to make your oatmeal bath bombs fizzy and bubbly. You will also need bath bombs molds – sturdy and durable, because you will have to compress the bath bombs mixture very hard so that your bath bombs don’t crumble later on. This is one of the easiest bath bombs recipes, and with just a little bit of practice and patience, you will soon become an expert in making your own DIY oatmeal bath bombs. We are going to start by mixing the dry ingredients first. In a bowl, put baking soda and citric acid and mix them well together. You can even put them through a sieve first, to get rid of any lumps. When citric acid and baking soda are well combined, add colloidal oats, oat flour or ground rolled oats and mix. Add Epsom salt and mix everything well together. If you want, you can add rolled oats, flower petals, glitter, color or anything else that comes to your mind. This will make your oatmeal bath bombs better looking, colorful and more fun. Melt two tablespoons of shea butter and add it to your dry ingredients. Add essential oil as well and mix everything until all the ingredients are well combined. Be patient, this may take a couple of minutes. Now, if you live in a high humidity area, your oatmeal bath bombs mixture may already be done. You can test this by taking a small amount of the mixture in your hand (you should wear gloves when working with citric acid). Squeeze the mixture well, then let go. If it doesn’t crumble after a few seconds, your mixture is all done and you can start molding. For most of us, however, the mixture will need some more liquid to hold its shape. For this, use witch hazel or rose water if you can. Aldo, you can just use plain water and your oatmeal bath bombs will still turn out perfect. But, you should always test the mixture first, instead of assuming it needs liquid and adding some right away. Finding the right balance between dry and liquid ingredients is the hardest part of making DIY bath bombs. Even a small amount can make a huge difference. Your mixture shouldn’t be too dry because it will keep falling apart. But it also shouldn’t be too wet, because water could activate the citric acid and your bath bombs won’t fizz well. For the same reason, you should proceed with adding the liquid very carefully. The best would be to put the liquid into a spray bottle. That way, it will be much easier to control the amount you are adding, but also – pouring water directly into the oatmeal bath bombs mixture will make the mixture fizz and later your bath bombs won’t fizz well. Add only 2 – 3 spritzes at the time, mix well, then test the mixture again. Once your mixture stopped falling apart and you are happy with its consistency, you can start molding it into the bath bombs shape. Scoop as much of the mixture as you can into both sides of your DIY bath bombs mold. Press well with your fingers to make sure your mixture is very tightly packed. Add more mixture to the molds, then press both sides together to get a ball shape. After 2 – 3 minutes, you can loosen your hold. Start tapping the molds lightly with your fingers or a spoon. The vibration you create will help release the bath bombs from the mold. Do this carefully so that you don’t ruin the shape of your bath bombs. Depending on the size of your molds, this oatmeal bath bombs recipe should be enough for 6 – 7 bath bombs. Store the rest of your bath bombs in a clean, dry area (it would be best to keep them in an airtight container or a ziplock bag). The shelf life of oatmeal bath bombs made like this is around 4 – 6 months, but this also depends on the shelf life of the ingredients you’ve used. So make sure to check that before starting to make any DIY bath bombs. DIY bath bombs are also a great gift for your family and friends. Just wrap each bath bomb individually in some nice wrapping paper and tie with ribbons. 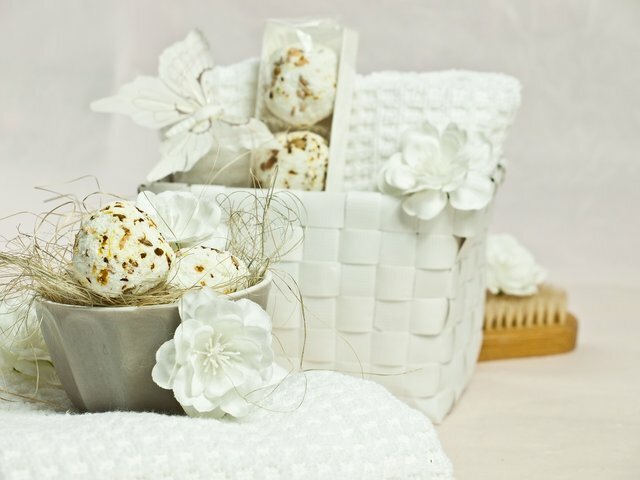 Arrange your oatmeal bath bombs nicely in a basket, whether on their own or in combination with some other DIY goodies. You can be sure oatmeal bath bombs will bring a smile to your loved ones’ faces every time they use them.